City and County of Honolulu: The county surcharge is effective from January 1, 2007 to December 31, 2030 at the rate of 0.5%. County of Kauai: The county surcharge is effective from January 1, 2019 to December 31, 2030 at the rate of 0.5%. 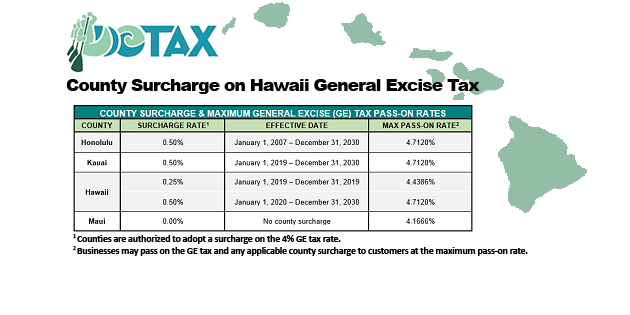 County of Hawaii: The county surcharge is effective from January 1, 2019 to December 31, 2020 at the rate of 0.25%. The county surcharge is only added to activities taxed at the 4.0% rate. The county surcharge does not apply to activities taxed at the 0.5% rate (e.g., wholesaling) or the 0.15% rate (i.e., insurance commissions). The county surcharge is computed and reported on Forms G-45 and G-49. Taxpayers who do business in more than one county must also complete Form G-75 and attach it to Forms G-45 and G-49. Taxpayers are required to allocate their gross proceeds and gross income to the designated taxation districts pursuant to sections 18-237-8.6-01 to 18-237-8.6-10, Hawaii Administrative Rules. The Department will be publishing additional guidance on the county surcharge, including a summary of the sourcing rules, shortly. The new county surcharge for Kauai and Hawaii county shall not be imposed for gross proceeds or gross income covered under written contracts if the gross proceeds or gross income are received as payments beginning in 2019, the contract was entered into before June 30, 2018 and the written contract does not provide for the passing of increased taxes. Tax Announcement 2005-11 Act 247, Session Laws of Hawaii 2005, Relating to County Surcharge on State Tax. Tax Announcement 2006-15 General Excise Tax (GET) and County Surcharge Tax (CST) Visibly Passed on to Customers. Tax Announcement 2006-17 Relating to the Application of the County Surcharge Sourcing Rules to Cash Basis and Accrual Basis Accounting Method Taxpayers.